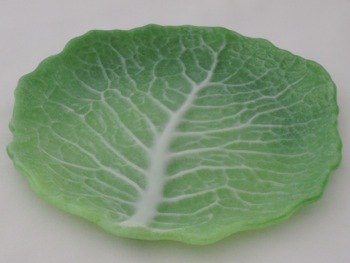 Our Cabbage Leaf designs creates ultra-realistic leaves approximately 8” (21cm) in diameter. 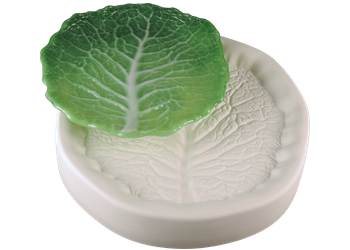 On the mold’s reverse side is a specialized slumping surface that shapes the cast leaves into plates with slightly wavy edges further adding to the finished pieces’ realism. 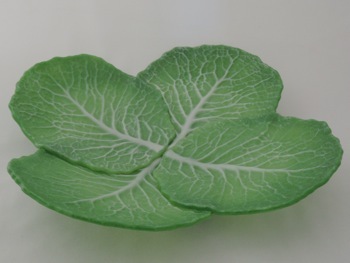 Gallery quality pieces can be crafted by tack fusing two or more leaves together and then slumping them into large bowls, platters, and wall art. 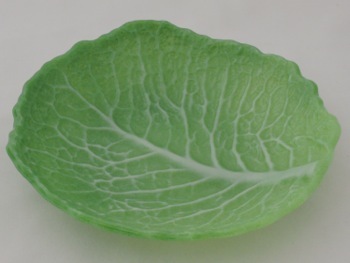 The mold itself measure about 10.5” (27cm) in diameter. The fill weight is 400 grams. Click on the green Learn tab to find project sheets and videos.